"Standard" with a difference. Besides the beautiful white core, Tru-White™ core mats are not only acid free-they are lignin free. Why does that matter? Acid is the natural property of paper mats. It causes the core to change color and degrades the image. Lignin is the ingredient in paper that causes the acid. If you don't take it out, an "acid-free" mat turns acidic in a relatively short time. Mats are approximately .050 thick and mat windows, unless specifically noted are centered so they can be used with a landscape image (horizontal) or a portrait image (vertical). All mats are buffered with calcium carbonate to resist acidity from the environment and other materials. 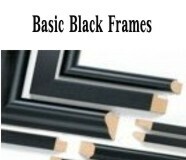 Want to try your hand at matting and framing. Need just one or two of each window. Want to "float" your print on top of matboard. Our Tru-White™ core blanks are the answer. These precut blanks are cut clean and square. They make mat cutting so much easier. All blanks use our best selling Tru-White™ core matboard, 4 ply thick, acid-free and lignin-free. Title Block mats in standard window sizes plus an additional window for identification or tribute. All in our best-selling Tru-White™ Core mat. Simply print out title on your computer. Matting has never been so easy! Multiple window mats available in a standard picture frame sizes. Present more than just single images. Tell a story with your photography and prints. Preserve your memories in our top-selling mat, Tru-White™ core. All mats are acid-free and lignin free, buffered with calcium carbonate and 4 ply thick.